THE iDOLM@STER Cinderella Girls General Election is an annual voting event for the mobile games THE iDOLM@STER: Cinderella Girls and THE iDOLM@STER Cinderella Girls: Starlight Stage. With the catchphrase "With your hands, select the Cinderella", players with a verified account (Cinderella Girls) or have cleared the first-panel mission, as well as are above PRank 20 (Starlight Stage) are able to cast their vote on the Cinderella Girls characters to be ranked. Ranking is determined by popular vote, and results are shown in the top 50 places. These rankings define an idol's (called candidates) standings of popularity for the year, with the idol in the number one place taking the title of "Cinderella Girl". Idols who rank high have certain benefits such as new cards, CD appearances, and occasionally even voice actresses. Currently, there have been seven "General Elections", each with Preliminary and Final result rankings. Another election, the "Anniversary Voice Idol Audition", was held in a similar manner but with the intent of voicing a single idol. The "1st Anniversary General Election" only ranked places 1 to 30, while latter polls ranked places 1 through 50. This idea of ranking seems to share many similarities to J-pop unit, AKB48, where all of its members are ranked by popularity. Notably, the 765 Production idols, the 876 Production idols, Rookie Trainer, Trainer, Master Trainer, Veteran Trainer and Chihiro Senkawa cannot be voted for. As the first election for the game, the winner was given the very first "Cinderella Girl" SR Card set. In addition to gaining a "Cinderella Girls" card set for the 1st place winner, the top 5 ranking idols would be featured on the unit CD THE IDOLM@STER CINDERELLA MASTER Kagayaku Sekai no Mahou. Because of her placement, Anastasia also received a voice actress, Sumire Uesaka, and her own CINDERELLA MASTER CD. In addition to gaining a "Cinderella Girls" card set, the top ranking idols would be featured on the unit CD THE IDOLM@STER CINDERELLA MASTER We’re the friends!. The idols in the top 5 places would sing a new original song, while the top three idols of each category would be featured in another group song. Because of their placement, Fumika Sagisawa and Yuki Himekawa also received voice actresses, M･A･O and Mako Morino respectively, and their own CINDERELLA MASTER CD. As the first "Voice Idol Audition" election in the game, only unvoiced idols before this election can be voted for and only the 1st place winner will be given a voice actress. Because of her placement, Arisu Tachibana had received a voice actress, Amina Satou. In addition to gaining a "Cinderella Girls" card set, the top ranking idols was featured in a released album titled THE IDOLM@STER CINDERELLA MASTER Absolute NIne. The idols in the top 5 places sang a new original song titled Tsubomi (Cinderella Girls), while the top three idols of each category was featured in another group song titled Absolute NIne. Because of their placement, Yumi Aiba, Shiki Ichinose, Syuko Shiomi, and Takumi Mukai will also receive voice actresses. In addition to gaining a "Cinderella Girls" card set, the top ranking idols would be featured on an upcoming unit CD. The idols in the top 5 places would sing a new original song, while the top three idols of each category would be featured in another group song. Out of the top 3 idols of each category, 4 of which are unvoiced, giving them each a voice actress as a result of the election. In addition to gaining a "Cinderella Girls" card set, the top ranking idols would be featured on an upcoming unit CD. The idols in the top 5 places would sing a new original song while the top three idols of each category would be featured in another group song. In addition, the 1st place winner will sing the winning solo song while the 1st place winners of each category will sing the winning unit song from THE iDOLM@STER Cinderella Girls: Starlight Stage election. Out of the top 3 idols of each category, 5 of which are unvoiced, giving them each a voice actress as a result of the election. The 1st place winner will sing Koi Kaze and the 1st place winners of each category will sing Tulip as a result of the THE iDOLM@STER Cinderella Girls: Starlight Stage election. In addition to gaining a "Cinderella Girls" card set, the top ranking idols would be featured on an upcoming unit CD. The idols in the top 5 places would sing a new original song while the top three idols of each category would be featured in another group song. In THE iDOLM@STER Cinderella Girls: Starlight Stage, the idols in the top 5 places will also be featured in an event, which will feature a special outfit for those 5 idols only. For the first time, THE iDOLM@STER Cinderella Girls: Starlight Stage players are eligible to vote for the idols in this election. Out of the top 3 idols of each category, 3 of which are unvoiced, giving them each a voice actress as a result of the election. In addition to gaining a "Cinderella Girls" card set, the top ranking idols would be featured on an upcoming unit CD. The idols in the top 5 places would sing a new original song while the top three idols of each category would be featured in another group song. In THE iDOLM@STER Cinderella Girls: Starlight Stage, the idols in the top 5 places will also be featured in an event, which will feature a special outfit for those 5 idols only. Syuko Shiomi was the first idol to gain a voice from becoming Cinderella Girl. Although Airi Totoki was unvoiced when she won the 2012 election, there was not a ranking CD for the 2012 election. The concept of an idol being voiced through the election started in 2013, with Anastasia placing 2nd and gaining a voice to sing Kagayaku Sekai no Mahou. Airi would get a voice either way through THE IDOLM@STER CINDERELLA MASTER 013 Totoki Airi. So far, Kaede Takagaki has never failed to rank highly within every Cinderella Girls General Election and has appeared in every yearly album song since the 2nd Election until the 7th General Election where she ranked at 4th place Cool and 8th place overall. When all the ranking vote results are tallied and averaged together, Kaede Takagaki is the highest-ranking cumulative idol by a long shot, followed by a quite a gap by Chieri Ogata, Nana Abe, Rin Shibuya, and Sachiko Koshimizu. An average total ranking (in Japanese), up to the 5th Election, can be seen here. 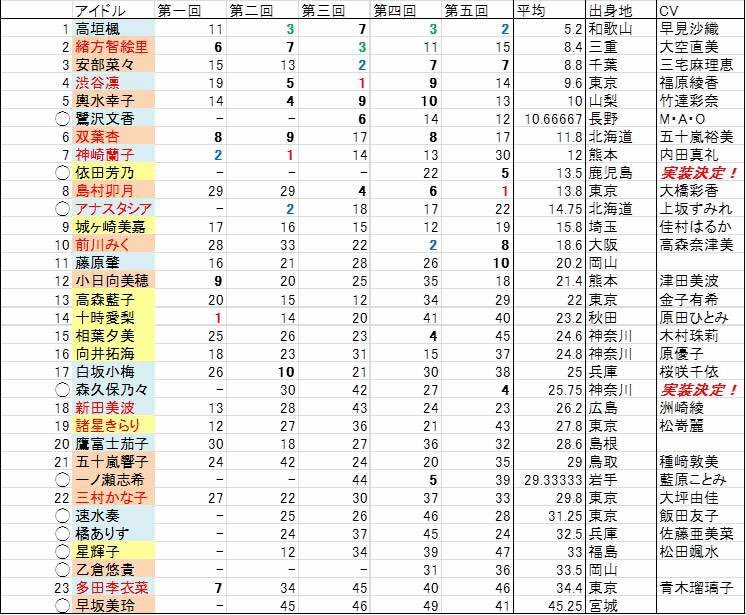 Be advised that not all idols who has consistently placed in the top ranks were included in order to save space (Like Karen Hojo whose averaged rank is the same as Sachiko, for example (As per 5th Election)). Use the average ranking purely as a point of reference. This page was last modified on 12 April 2019, at 07:23.